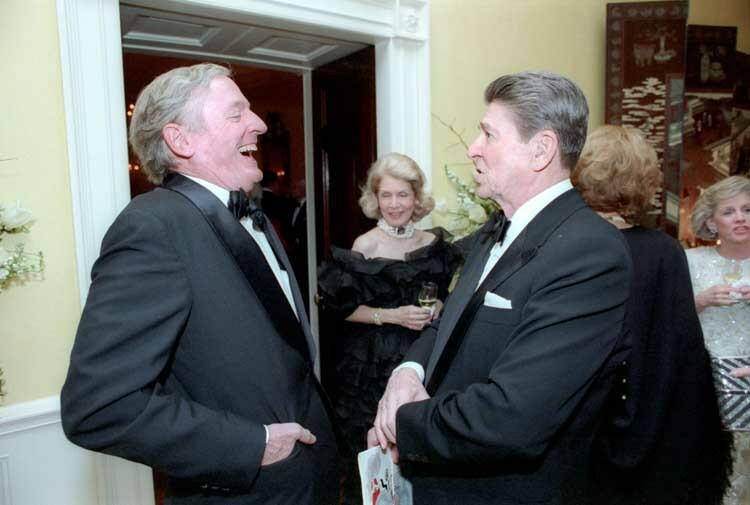 William Buckley and Ronald Reagan on Reagan's birthday in 1986. If it is true that the evil men do lives after them, William Francis Buckley can be assured a certain kind of immortality. Or perhaps it is going too far to say that he did evil. That is probably too active a word. Perhaps it would be more accurate to say that he lived off evil, as mold lives off garbage. The garbage he is particularly associated with is that which began accumulating in the right-wing alley about forty years ago: McCarthyism, which Buckley took part in by writing speeches for Senator Joe and by praising with majesterial cliches (“McCarthyism is a movement around which men of good will and stern morality can close ranks”); and the long-forgotten manifestoes of the Young Americans for Freedom, a frenzied campus movement which he helped found in 1960; and his pious defense of the kooks of the John Birch Society as “some of the most morally energetic self-sacrificing and dedicated anti-Communists in America.” In those days Buckley lent his name—as adviser or supporter or officer—to virtually every major crackpot right-wing movement in America, and his ideological soulmates were a group that long ago were banished to history’s padded cell…. Today Buckley does not live off right-wing garbage or anything else because he is quite dead, and has been dead for at least fifteen years. At least that’s my theory. But because the right wing is so sentimentally attached to its old shills, Buckley has been put away in hypothermal storage in the hopes that medical science someday will be able to defrost him and reactivate his brain. Meanwhile, the pretense that Buckley lives is carried on from time to time through stories about him, or ghosted under his byline, in such mortuary trade journals as New York and The New York Times. As for the two-bit actor who plays Buckley on Firing Line, Lord knows he is a poor imitation, thinking he fills the part merely by uttering unintelligible gibberish through pursed lips while fiddling with pencil and clipboard.